Let CarCareONE help you get your car or truck repaired and back on the road when a big repair slows you down. Plus, use the card everyday for routine maintenance, tires and wheels, gas and more. 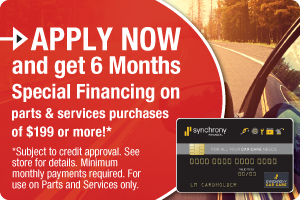 And, take advantage of low monthly payments. Accepted at Over 16,000 Locations Nationwide. Buy Gas at Exxon and Mobil Stations. The CarCareOne card is accepted at all U.S. Exxon and Mobil gas stations. Find a station near you and keep other credit cards free for other purchases.